INSTANTLY Cover Your Grays Between Hair Colorings! Toppik Colored Hair Thickener is an innovative color spray specially designed to disguise areas of thin hair, root re-growth between color appointments, scalp show-through and even bald spots. This lightweight spray solution provides instantly fuller, thicker-looking hair. Formulated with unique pigments that match your desired hair color, Toppik Colored Hair Thickener is easy to apply and looks completely natural. Dries quickly and will not rub off on clothes or even your pillowcase, yet it removes easily with shampoo. The long-lasting formula is gentle on the scalp and safe for everyday use, even on color-treated hair. Available in 5 natural-looking shades and works for men and women with all hair types and textures. Directions: Shake very well before each use. Use only on dry hair. Comb hair away from thinning area. Hold 4-6 inches away from root and spray in short bursts until area of concern is completely covered. Allow to dry for a few seconds. This lightweight, long-lasting hair thickener is gentle on the scalp, safe for everyday use and available in 5 shades that resist wind, rain, and perspiration. 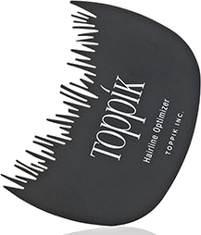 Use with Toppik Hair Fibers for additional coverage and natural texture. Easily shampoos out. Won’t clog pores. A. Toppik Colored Hair Thickener does not encourage or discourage hair growth. 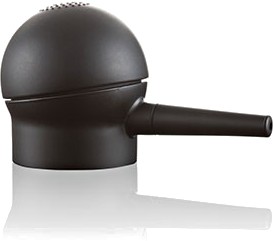 It won’t flake or rub off, and it doesn’t clog pores or affect any scalp conditions. Contact us at 658-3658 for a retailer near you.